Light can be used to modify and control properties of media, as in the case of electromagnetically induced transparency or, more recently, for the generation of slow light or bright coherent extreme ultraviolet and X-ray radiation. Particularly unusual states of matter can be created by light fields with strengths comparable to the Coulomb field that binds valence electrons in atoms, leading to nearly free electrons oscillating in the laser field and yet still loosely bound to the core1,2. These are known as Kramers–Henneberger states3, a specific example of laser-dressed states2. Here, we demonstrate that these states arise not only in isolated atoms4,5, but also in rare gases, at and above atmospheric pressure, where they can act as a gain medium during laser filamentation. 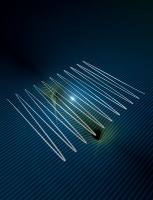 Using shaped laser pulses, gain in these states is achieved within just a few cycles of the guided field. The corresponding lasing emission is a signature of population inversion in these states and of their stability against ionization. Our work demonstrates that these unusual states of neutral atoms can be exploited to create a general ultrafast gain mechanism during laser filamentation.